This unique interdisciplinary course aims to bridge the gap that emerged in the Nineteenth Century between the discipline of art history and fine art practice. Over seven weeks, tutors with backgrounds in art history and the visual arts will progressively address the artistic revolution that was the Italian Renaissance. Each week, subjects such as the Byzantine icon, perspective, the role of antique sculpture, human anatomy, portraiture, drapery and landscape conventions will be historically analysed in a lecture followed by a practical workshop. Lecture: The Renaissance is understood as the rebirth of classical art and marks the transition of Europe from the late-medieval period to the early-modern age. We will look at its leading instigators, the painter Cimabue and his pupil Giotto. These artists emerged out of the context of the dominant Byzantine artistic tradition, imbuing their religious images with an innovative attention to naturalism. Art Class: The origins of the Renaissance will be demonstrated within the context of the former dominance of Byzantine art. The iconographer Dr Anita Strezova, will show through her own work, the methods employed to create the Byzantine icon. The famous Renaissance artist and historian, Giorgio Vasari, called Byzantine art ‘the Greek style’ and denoted it as an artistic decline that bridged the glories of the classical past and its so-called renewal in Italy in the fourteenth to sixteenth centuries. This class will further call into question and problematize notions of art historical progression and stylistic “improvement”. Lecture: The development of linear perspective allowed artists to convey the illusion of space upon a flat surface. The emergence of perspective in the Italian Renaissance will be examined within the context of the architect Filippo Brunelleschi. Art Class: The application of perspective, discussed in the lecture in relation to both the urban architectural environment and developments in painting, will be practically addressed relative to basic geometric shapes. Starting with a simple cube, students will analyse how the object’s front, side, upper and lower planes are perceived within perspectival space. Students will then take short turns modelling at the front of the class. Following in the footsteps of Genoese painter Luca Cambiaso (1527 – 1585), the model will be conceived in terms of very basic cylindrical forms. These basic forms will be employed to demonstrate both the direction of the body’s major masses and how the upper and lower planes of the human figure are conceived in relation to the student’s own horizon line. Lecture: We will look at how artists of the fourteenth and fifteenth century reappropriated both antique sculpture and architecture for the early-modern period. 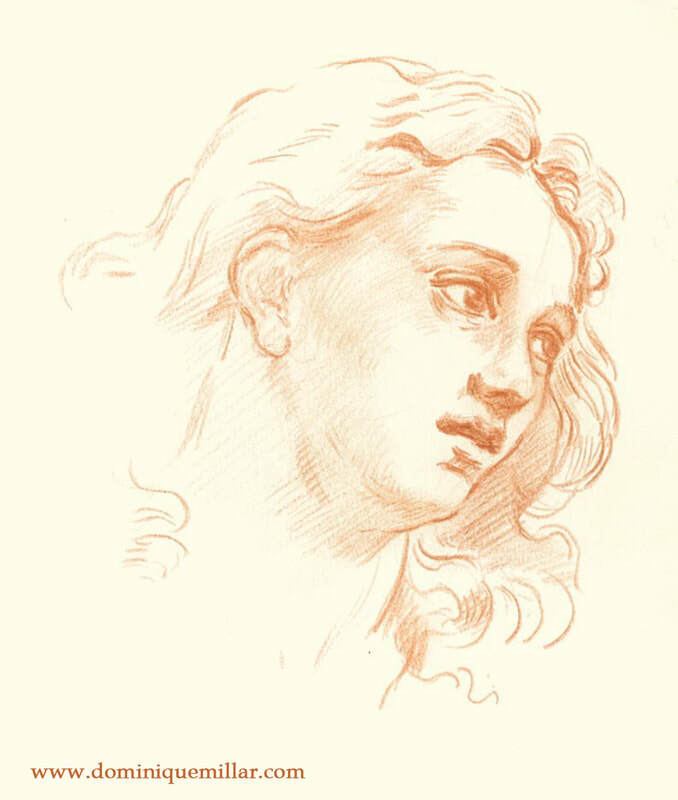 Art Class: In this class we will look at drawing from classical sculpture – or what is often termed “drawing from the antique”. A copy of an antique sculpture will be set up to draw from. The sculpture will be positioned in relation to a one directional light source. This will allow the student to clearly perceive the sculpture’s volume and form as elucidated by the light source. Students will first draw the overarching shape of the sculpture, breaking its form down into directional lines (discussed within the previous class). As time permits these lines will be further refined and shading may be added to suggest light, shadow and form. Lecture: Both Leonardo da Vinci and Michelangelo Buonarroti have left a great number of drawings that are testament to their deep knowledge of the human form. In this session we will examine how the drawing of the human figure became more empirically rigorous in the works of these artists. Art Class: With the use of a life model, we will begin by addressing the basic anatomical skeletal landmarks of the human figure. As the skeleton functions as a structural mass within the body, we will examine how this is perceived in terms of the artistic construction of the human form. The basic muscle groups of the human body will be broadly discussed. Students will then attempt to faithfully draw the model’s lower torso and legs. With the aid of contemporary anatomical diagrams as well as anatomical drawings by Michelangelo, students will try to identify skeletal landmarks and muscle groups within the lower torso and legs and label these on their drawings. Lecture: This lecture will look at the role of drapery and contemporary fashion within Renaissance painting. How did stylistic conventions for depicting drapery change and evolve between the fourteenth and sixteenth centuries? In addition, what do depictions of clothing tell us about religious iconography and social status? Art Class: Students will each be lent a mannequin and a piece of cotton rag. With printed examples of drapery as inspiration, students will cut their cloth to the desired size, dip it into a plaster solution and then arrange it as desired over the mannequin. Students will have to consider whether their mannequin will be standing or sitting, stationary or suggestive of action, and how the placement of drapery on the figure will enhance or deter attention from the mannequin’s action. Furthermore, the drying plaster will give the student the option of allowing the cloth to appear to fall with gravity or rise and undulate under the suggestive influence of a breeze. Once the plaster has dried, students will proceed to draw the hardened folds. We will further discuss in class what some of the advantages of this process were for artists wanting to capture the ephemeral folds of drapery. Lecture: Portraiture first appears in religious art depicting church donors. In time, portraiture evolved into an independent genre. In this lecture, we will look at the evolution of the genre of portraiture between the fifteenth and sixteenth centuries. The Venetian painter Titian will be examined as an artist renowned for his depiction of princes, members of the nobility and the educated classes across Europe. Art Class: We will discuss the proportions of the human head and the anatomy of the skull, including the relationship of the head to the neck and upper torso. The features of the face will be seen within the context of conceptualising the head in terms of a simplified overarching egg shape. We will also look at the convention of the waist high portrait. The use of geometric shapes to frame the pose, such as the triangle, will be examined. Lecture: Landscape as an independent genre only emerged in Italy towards the end of the sixteenth century. Landscape only had a subsidiary role in the works of Italian painters, until it gained a greater significance in the works of Venetian painters such as Bellini, Giorgione and Titian. It was not until the later sixteenth century, however, under northern European influences, that landscape developed into the independent genre we have come to recognise. Art Class: Students will be given a drawn study of pine trees by the French painter Claude Lorrain to copy. The aim of this exercise will be to carefully copy the lines Claude employs to suggest the form of trees and rocks, the fall of light on foliage and the texture of branches and leaves. On completion of this exercise, students will be given a photograph of a similar landscape. The aim will be to interpret the image in the photograph, using the same lines and marks that were observed within Claude’s drawing. By examining the shorthand means by which Claude employs drawing to suggest ephemeral natural forms, students will be able to perceive how Old Master drawings might be employed as a reductive aid in describing the natural world. Gain a context that bridges the conceptual divide between art history, criticism and practice. Be able to relate specific visual art practices to art historical developments, innovations and conventions. Critically analyse and practically apply certain aspects of historical craftsmanship. Consider the strengths and limitations in attempting to understand the past in terms of the visual and written historical record and our ability to duplicate or “reinvent” its application within a contemporary context. Note: Please arrive to the first class with all the relevant materials. A lack of materials is not just a handicap to you but to the ability to teach. "The course was delivered with enthusiasm and a high degree of scholarship and professionalism. As such, it could easily be considered as a foundation course for anyone interested in the Italian Renaissance. It would be difficult to find a better course in Art History at any adult education or tertiary institution. Highly recommended."